The following reports on labor-market policy were released over the past week. Ariane Hegewisch, Claudia Williams and Robert Drago, Ph.D.
Over the past month, the Center for Economic and Policy Research, Drum Major Institute for Public Policy, Economic Policy Institute, Employment Policy Research Network, Political Economy Research Institute, and The Roosevelt Institute have released reports on issues relating to labor-market policy. The unemployment rate climbed back up to 9.1 percent in May, as the rate of private-sector job growth slowed to just 83,000, according to the latest Bureau of Labor Statistics employment report. The prior two months data were also revised downward, lowering the average job growth for the last three months to 160,000, approximately 70,000 more than what is needed to keep pace with the growth of the labor force. The weakness in the private sector goes along with a government sector that lost 29,000 jobs in May and has lost an average of 24,300 jobs over the last three months. State and local governments will continue to make cutbacks, and there is a strong likelihood of further cuts in federal spending in the fiscal year beginning Oct. 1. Without new stimulus, the unemployment rate may continue to creep upward. For more information, check out our latest Jobs Byte. The following newsletter highlights CEPR's latest research, publications, events and much more. CEPR Co-Director Mark Weisbrot wrote an op-ed that was published in the New York Times (CEPR’s first op-ed to appear in the print edition). The op-ed, titled “Why Greece Should Reject the Euro”, argues that Greece should at least consider leaving the euro. The op-ed received a great deal of attention from the press, including this blog post by New York Times columnist Paul Krugman. Krugman gives Mark kudos for suggesting that Greece consider abandoning the euro, but he stops short of endorsing the idea. Mark countered with this Guardian column, where he defends his position, stating: “Whether or not these countries decide to rethink the euro itself, simply reconsidering – in all of Europe – the right-wing economic policies of the eurozone authorities would be a big step forward for the region.” Mark also discussed the Greek debt crisis with Andrea Catherwood on Bloomberg Television's "Last Word", with Theo Caldwell on Sun News’ “The Caldwell Account,” and other programs. Mark also published an article on solving the euro crisis that appeared in The Nation. CEPR Co-Director Dean Baker weighed in as well, penning this article on the European Central Bank. Yesterday, CEPR was honored to present some our research at the 2011 Asian American and Pacific Islander Summit, hosted by the Congressional Asian Pacific American Caucus (CAPAC) and House Democratic Leadership. CEPR's presention, titled The AAPI Perspective on the Recession and the Recovery (pdf), was part of the Summit's Economic Development and Housing Panel. 1. 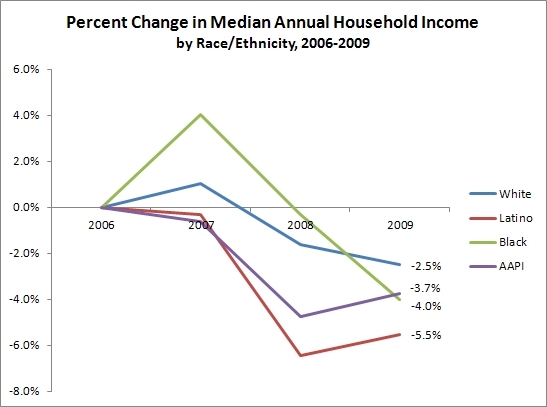 AAPIs suffered just as much as other racial/ethnic groups in the recession. 2. Aggregate data about AAPIs mask remarkable diversity within the AAPI community. 3. 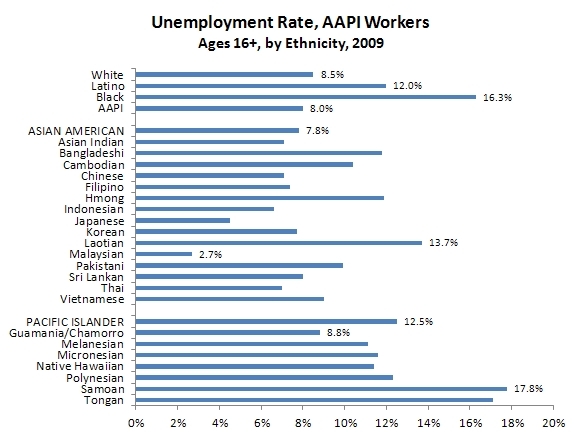 “Good policy requires good data.” There is a need for better disaggregated data about AAPIs. 4. CEPR will release a major report about AAPI workers in July. This presentation is a preview of that work. Click here (pdf) to view the entire presentation. Why Do Opponents of Social Security Have So Much Difficulty Getting Their Facts Right? The obvious answer is because it doesn’t matter. Those pushing for cuts in Social Security and the other big items on the right’s agenda can get the basic facts about Social Security, the budget and the economy wrong over and over again and it doesn’t in any way affect their standing in the public debate on these issues. One need only look at the career of former Senator Alan Simpson, who has repeatedly shown that he doesn’t have the most basic understanding of the finances of the Social Security system, yet is still seen as a respected voice on this topic. In keeping with this “ignore the facts” approach, the Progressive Policy Institute recently released a paper by Sylvester Schieber telling readers that Franklin Roosevelt would be pushing large cuts in Social Security benefits for middle income workers. Schieber and the Progressive Policy Institute have been pushing cuts to Social Security for close to two decades so it is not exactly surprising that they would be trying to take advantage of the current hysteria around the budget deficit to push their agenda on this topic. Why would Mr. Schieber and the Progressive Policy Institute think that CEPR is a research arm of the AFL-CIO? CEPR lists our funders on its website, which clearly states that “CEPR does not receive any funding from corporations, unions, or foreign governments”. Neither the AFL-CIO nor any individual unions appear on this page. Or, they could have looked to the 990 forms filed with the IRS every year. In fact, CEPR provides a link to our financial forms on the sidebar on nearly every page of our website. It’s possible that Schieber and the Progressive Policy Institute live in some crazy fantasy world, but it’s more likely that they just assumed that because CEPR has been aggressive in telling the truth and confronting misinformation from Wall Street funded organizations, that it must be on the payroll of the AFL-CIO. Will the Cartagena mediation process help resolve the crisis in Honduras? Many Latin America watchers were thrown for a loop last month when a bilateral meeting in Cartagena, Colombia between Presidents Hugo Chavez of Venezuela and Juan Manuel Santos of Colombia suddenly metamorphosed into a trilateral encounter that included Porfirio Lobo, the controversial president of Honduras. It was hard enough grappling with the image of Chavez and Santos, considered to be arch-enemies only a year ago, slapping one another on the back and heralding warm relations between their countries. Now it appeared that Chavez had also warmed up to Lobo, the leader of a government that Venezuela and many other South American countries had refused to recognize since the coup of June 28, 2009 that toppled democratically-elected president Manuel Zelaya. Various media outlets were quick to suggest that, as a result of the friendly meeting, Chavez was prepared to back the return of Honduras to the Organization of American States (OAS). Since Venezuela had been the most outspoken critic of Honduras’ post-coup governments, it seemed conceivable that in no time the country would recover the seat that it had lost by unanimous decision of the OAS’ thirty-three members following the 2009 coup. But soon more details emerged from the meeting that suggested that there were still significant hurdles ahead for Lobo. Chávez had not in fact agreed to support Honduras’ immediate return to the OAS. Instead the three leaders had drawn up a road map for Honduras’ possible return with the direct input of exiled former president Mel Zelaya, who was reached by phone during the meeting. As had occurred in previous negotiations, a series of conditions were put forward with the understanding that their fulfillment would open the door to OAS re-entry. Core inflation remained low last month as the Consumer Price Index rose 0.4 percent in April and at a 6.2 percent annualized rate over the last three months, according to the Bureau of Labor Statistics' latest report on the consumer price and the producer price indexes. A rapid increase in energy prices continues to drive headline inflation. Energy prices were up 2.2 percent last month and were at a 42.8 percent annualized rate over the last three months as they recovered from 2008, when they fell 35 percent in just five months. Energy prices currently stand at 7 percent below the peak in July of that year. With core inflation remaining low and real hourly earnings flat or falling over the last six months, there is little general concern of rapid price increases. (The average real wage has fallen 1.6 percent in the last two years.) As energy prices return to their 2008 levels, some slowing of headline inflation may result. This week, we post links to reports from Center on Budget and Policy Priorities and Economic Policy Institute. Even though the economy created 244,400 new jobs in April, the unemployment rate returned to 9.0 percent, according to the Bureau of Labor Statistics' latest employment report. Last month was the third consecutive month of job growth in excess of 200,000, with an average of 233,000 per month. While the growth is encouraging, the rise in employment last month benefited from one-time factors that will not be repeated, such as job growth for retail and restaurants inflated by the later-than-usual Easter. The April rise in unemployment was almost certainly just a measurement error that partially reversed the extraordinarily rapid decline reported in December and January. Over the last year, the household survey shows employment growth of just 764,000 (adjusted for the change in population controls). This compares to an increase of 1,313,000 jobs reported in the establishment survey. We should have expected labor force growth of roughly 1,000,000 over this period. This implies that the job growth we have seen should have only led to a drop in unemployment of 0.2 percentage points, not the 0.8 percentage point drop we actually saw over the last year. "But a typical U.S. household consumes about 11,000 KWh of electricity per year. Based on testing done by the department, a microwave oven in “standby mode” consumes an average of just 2.65 watts of power. On an annualized basis, that constitutes a mere .006452 KWh of electricity." Indeed, 0.006452 kWh per year is not a large amount of power—merely 0.00006 percent of typical household consumption. By comparison, 0.00006 percent of all federal spending ($3.7 trillion in 2011) comes to $2.2 million— about equal to seven minutes of spending on the wars in Afghanistan and Iraq ($159 billion). Unfortunately, 2.65 Watts actually comes to 23.2 kilowatt-hours per year— a figure 3600 times larger. Thus, a single unused microwave accounts for 0.2 percent of the annual electricity in the typical household. UPDATE: Katz has corrected the error. Krugman on "The Lump of Austerity Doctrine"
Paul Krugman is on target, as usual, in his Friday post on Argentina’s experience and the Euro zone. However, there are some details worth adding. First, Argentina’s remarkable expansion, in which it grew 63 percent over six years, was only export-led for the first six months. It also got a boost from the devaluation in the form of billions of dollars of capital that had fled during the 1998-2002 recession, coming back into the country because the peso was now worth about a third of its previous level against the dollar. So this is also a benefit of devaluation, but not in the current account. Most importantly, the vast majority of the benefits that Argentina got from the collapse of the currency and accompanying events did not come from net exports. It came from other policy changes, including macroeconomic policy, that were not possible while the fixed peso/dollar exchange rate was being maintained. This is particularly relevant for Europe because the same is true for the trapped Euro zone countries (and Latvia and Estonia, with currencies pegged to the Euro) currently suffering through the Argentine (pre-2002) –style “internal devaluation.” Much worse than the effect of an overvalued exchange rate on the net exports of Spain, Greece, Ireland, Portugal, or Latvia are the pro-cyclical fiscal and monetary policies that they are tied to by the European authorities. Returning to Krugman’s table for a moment, most of the adjustment of the current account in Argentina took place the hard way, through one of the worst recessions in the 20th century. In 2002, which registers a GDP decline of 10.8 percent year-over-year (although recovery began in the second quarter), it is worth noting that the size of the 8.5 percent of GDP current account surplus is mostly the result of measurement associated with the devaluation (i.e. Argentina’s GDP measured in dollars had fallen by more than two thirds). The world-record sovereign debt default ($95 billion) also boosted the current account by cutting foreign debt service, and this too – Greece take notice – was essential for the recovery. Argentina also instituted some other important heterodox policies that helped restore fiscal balance, including a windfall profits tax on exporters who benefited from the devaluation. No European bank run triggered by a country exiting from the Euro could be anywhere near as bad as the collapse of the banking system in Argentina that followed their abandonment of the fixed exchange rate and default. If it is going to take Greece, as projected by the IMF, more than 10 years to reach their pre-crisis level of output (it took Argentina 3 years), then exiting the Euro may very well be a better option. Perhaps even more importantly, the European authorities have enough money to help all of the peripheral countries recover through counter-cyclical, rather then pro-cyclical policies. Although all of their situations are different, I would think that a responsible leader in Greece, Ireland, Portugal or Spain would use the threat of exit (and default) to force the European authorities to help them, instead of punishing them. There is an incredible amount of sanctimonious garbage going around Washington about the horrors of the deficit and the debt. In fact, there is so much nonsense that it would be impossible to ever run out of frequently repeated assertions to ridicule. One assertion that has gotten insufficient derision is that Clinton and/or the Gingrich Congress (pick your "hero") took the tough steps needed to balance the budget. Some of us are old enough to remember the 90s. That isn't quite what happened. If we go back in 1996, we see that the Congressional Budget Office (CBO) was still projecting a large deficit for the year 2000. In May of 1996 CBO projected that the deficit in 2000 would be $244 billion or 2.7 percent of GDP. It turned out that we actually ran a surplus in 2000 of $232 billion, or roughly 2.4 percent of GDP. This involves a shift from deficit to surplus of $476 billion or 5.1 percentage points of GDP. This would be equivalent to reducing the annual deficit by $750 billion in 2011. The reason for picking 1996 as the year to look at projections is that the Clinton tax increases were already law, and therefore included in the baseline projections at that point. The same is true of most of the spending cuts demanded by the Gingrich Congress. Here's CBO's assessment of the changes that moved us from large projected deficits to a large budget surplus. Source: Congressional Budget Office and authors' calculations. In this update, we post links to recent reports from the Center for American Progress, Center for Law and Social Policy, Economic Policy Institute, Employment Policy Research Network, Institute for Women's Policy Research, and Political Economy Research Institute. The most recent paper, “Representative Ryan’s $30 Trillion Medicare Waste Tax”, takes the analysis one step further to show that the Ryan proposal will increase health care costs for seniors by more than seven dollars for every dollar it saves the government, a point missing from much of the debate over the plan. The paper was mentioned in this article in The Progressive and in this post on Talking Points Memo. Dean discussed the Ryan plan with Rachel Maddow and the Real News, authoredseveral columns on the plan, and was quoted in several news articles and blogs, including this one by Paul Krugman. Dean also weighed in on President Obama’s budget plan, here in a CEPR press release, here in the New York Times’ Op-Ed section “Room for Debate”, here in the Wall Street Journal online and here on the Rachel Maddow show, where Dean re-iterated that all the talk of deficit reduction ignores the current problem of 25 million people under- or unemployed. Dean also appeared on the Diane Rehm Show where he discussed these issues as well as the debate over raising the debt ceiling. The facts are very clear on this: The public would hate Rep. Ryan's Medicare plan, if they realized what it is. Every poll shows that the public overwhelmingly supports the Medicare program in its current form. This is true across the board. Even the overwhelming majority of Republicans support keeping Medicare in its current form. The Ryan plan is quite explicitly designed to end Medicare as we know it in the same way that Jonas Salk designed a vaccine to eliminate polio. There is no real question here, it gets rid of the Medicare system for anyone under age 55 today and replaces it with a voucher. The projections from the Congressional Budget Office show that the Ryan plan would raise the cost of buying Medicare equivalent policies by $34 trillion over Medicare's 75-year planning period. This sum comes to $110,000 for every man, woman, and child in the country. It is almost seven times as large as the projected Social Security shortfall that makes the Washington pundits so excited. This $34 trillion is pure waste. It is the Congressional Budget Office's projection of the additional payments to insurers, drug companies, hospitals and other health care providers that would result from relying on private insurers instead of the traditional Medicare program. In addition, Ryan's plan would also transfer about $4 trillion in costs from the government to beneficiaries. Unfortunately, very few media outlets believe it is their responsibility to provide information about government policies. They obviously believe that the typical person has more time and ability to analyze budget proposals than their reporters. As a result, most of the public still doesn't realize that the Republican majority in the House of Representatives voted to end Medicare. So the question is whether a group of activists can go around the media and explain the general public what their representatives in Congress are trying to do. In the pre-Internet Age, they wouldn't have a chance. However, with the vast majority of families now on the web, it is possible that these protests will be successful in calling attention to the Republicans' plan to end Medicare. With luck, the media may even pull a reporter or two from Trump-birther beat and have them analyze the Ryan plan. This post originally appeared on POLITICO's The Arena. In the first quarter of 2011 car sales advanced at a slower pace, causing GDP growth to fall from 3.1 percent in the fourth quarter of 2010 to 1.8 percent, according to the latest Bureau of Economic Analysis' report on the Gross Domestic Product. Declining sales slowed the rate of consumption growth from 4.0 to 2.7 percent. In addition, unusually bad weather had an effect on construction, subtracting 0.72 percentage points from growth in the quarter. Investment in equipment and software, however, maintained strong growth, rising at an 11.6 percent annual rate. Equipment and software investment were equal to 7.4 percent of GDP in the quarter, just 0.5 percentage points below the pre-recession level. This is remarkably strong given the amount of excess capacity in most sectors of the economy. While it might not sustain its double-digit growth rate, it is likely to remain healthy throughout the year as the investment tax credit pulls investment forward. For more information, read our latest GDP Byte. This report confirms that ultra-low interest loans provided by the Federal Reserve during the financial crisis turned out to be direct corporate welfare to big banks. Instead of using the Fed loans to reinvest in the economy, some of the largest financial institutions in this country appear to have lent this money back to the federal government at a higher rate of interest by purchasing U.S. government securities. Last month, you testified that the House 2011 budget plan, which would have cut $60 billion in spending, would cost the nation about 200,000 jobs over two years. In your opinion, how would the recently-passed House 2012 budget, which cuts trillions in spending, affect the economy and unemployment rate? The Federal Reserve Act states that the Fed's goals are to both promote "maximum employment" and "stable prices." Currently inflation is exceptionally low, while unemployment is painfully high and projected not to return to pre-recession levels for a decade. Do you believe that the Fed's goal of maximum employment is as important as price stability, and if so, what more aggressive actions should the Fed take to reduce unemployment? Prominent economists, including the chief economist at the International Monetary Fund, suggested that central banks should target an inflation rate of between 3-4 percent. The current policy of targeted 2 percent inflation had proven incredibly costly to the country's workers. Has the Open Market Committee discussed these recommendations, and if not, why not? In the current downturn, the Fed bought hundreds of billions of dollars of long-term government bonds and more than $1 trillion of mortgage backed securities in order to help keep long-term interest rates low and to support the economy. Instead of selling this debt back to the public, as currently intended, if the Fed were to hold this debt indefinitely, and as Japan has done without sparking any inflation, it would keep the flow of interest on this debt going to the Fed and therefore back to the Treasury. This way the debt issued to support the economy in the downturn does not become a burden on the government in the future. Would you support such a move by the Federal Reserve? One week later after Secretary Paulson proposed the TARP in Sept. 2008, you testified before Congress that "deteriorating financial market conditions have disrupted the commercial paper market and other forms of financing for a wide range of firms... I urge the Congress to act quickly to address the grave threats to financial stability that we currently face." On Oct. 3, the TARP became law. Four days later on Oct. 7, the Fed announced the creation of the Commercial Paper Funding Facility (CPFF) to "encourage investors to once again engage in term lending in the commercial paper market." If you knew in Sept.that the slowdown in the commercial paper market was a grave threat to our economy, why did you wait two weeks before announcing the creation of the CPFF? Shouldn't you have told Congress of your plans to create the CPFF before it voted on the TARP? Rep. Grijalva of Arizona announced today his introduction, with 13 co-sponsors, of the Right to Rent Act of 2011 (H.R. 1548), which would allow families facing foreclosure to remain in their homes as renters paying the fair market rent. Housing shouldn't be a politically charged issue -- this is a basic question of fixing a problem we can't ignore. Democrat, Republican or independent, we’re all here in Congress to represent our constituents and make sure the federal government is acting in their best interests. Right now, we can’t afford to pretend those interests are served by us doing nothing. Finally, the right to rent could free up money that is currently going to mortgage payments on homes where owners never accrue any equity... The money saved by former homeowners is money they will spend in the communities where they live. Finally, foreclosure must be eliminated as a trigger for eviction. This includes developing more extensive options for families who are unable to avoid foreclosures, such as enhanced rental option programs that allow struggling families to remain in their homes for at least a year as tenants rather than homeowners. Dean Baker first introduced the concept of R2R in 2007, and Andrew Samwick (former Council of Economic Advisers chair for George W. Bush) quickly joined him in a joint op-ed. A year and a half ago, R2R got a flurry of attention from bloggers such as Ezra Klein and Felix Salmon when the Obama Administration, as well as Sen. Schumer and Sen. Durbin, indicated some support for the idea. Could the third time be the charm for Right to Rent?